Featuring the voices of Shameik Moore, Hailee Steinfeld, Mahershala Ali, Jake Johnson, Liev Schreiber, Brian Tyree Henry, Luna Lauren Velez, Lily Tomlin, Zoë Kravitz, John Mulaney, Kimiko Glenn, Nicolas Cage, Kathryn Hahn, Liev Schreiber, Chris Pine, Natalie Morales, Oscar Isaac, Edwin H. Bravo, Greta Lee, Jorma Taccone, Lake Bell, Post Malone and Stan Lee. Screenplay by Phil Lord and Rodney Rothman. Distributed by Columbia Pictures. 117 minutes. Rated PG. Starring Tom Hardy, Michelle Williams, Riz Ahmed, Scott Haze, Reid Scott, Jenny Slate, Ron Cephas Jones, Michelle Lee, Melora Walters, Marcella Bragio, William W. Barbour, Mac Brandt, Sope Aluko, Sam Medina, Donald K. Overstreet, Christian Convery, Michelle Fang, Woody Harrelson and Stan Lee. Screenplay by Jeff Pinker, Scott Rosenberg and Kelly Marcel. Distributed by Columbia Pictures. 112 minutes. Rated PG-13. Spider-Man, the nerdy teenager given the proportional strength of a spider, has had many incarnations over the decades in the comic books – whether it’s the nerdy Steve Ditko original, the hunky Romita senior version, or the porcine Spider-Ham. In the mid-’80s, Marvel, looking to compete with the likes of He-Man in the minds of kids, launched an event called “Secret Wars,” resulting in Spidey ditching the red and blue tights in favor of a sleek black costume made of a sentient alien goo known as the Symbiote. But when the honeymoon period was over, the alien suit made its way to journalist Eddie Brock, who became Venom, the toothsome villain/sometimes anti-hero. 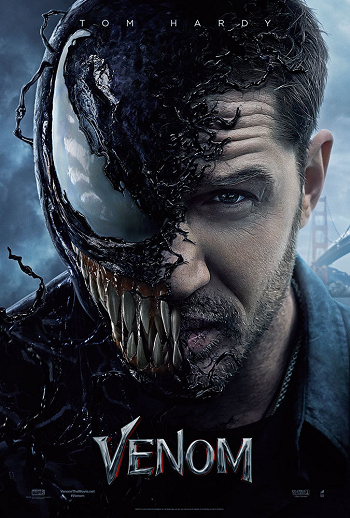 In the recent eponymously named live action film, the alien symbiote merged with journalist Brock (Tom Hardy) which granted him super strength but also inextricably bound him to the alien slime. Peter Parker, however, is nowhere to be seen in this film, which is loosely based on the Venom created by David Michelinie and Todd McFarlane, and the story went off in its own strange directions, harkening back to an era of super-films that were more concerned with the here-and-now than the mega-franchises down the road. In the case of the Spider-verse, other Marvel madmen came up with the idea of a multiverse with endless Spider-man variants, pulled together over the decades. The digitally animated “Spider-Man: Into the Spider-Verse” – was based on the idea that an African American teenager, Miles Morales (who originally appeared in Marvel’s Ultimate line of comics, and that set much of the tone and look of the current Avengers films), got bitten by a radioactive spider, suddenly developed mysterious powers (which transforming him into an Alternate Earth Spider-Man), and then, as the hero, saved the many universes. In the place of the original Peter Parker, Miles is another nerdy teen who battles the hulking madman crime boss Kingpin – who has gone from extortion and drug trafficking, to opening portals to other dimensions. The Webhead’s colossal foe now threatens not only this Earth’s Spidey, but also has the power to destroy a bunch of other Spideys, such as a Japanese girl with a giant spider-robot, and an alternate version of Parker’s deceased gal-pal Gwen Stacy (who is now not dead but is masked). Since Sony Pictures’ executives retained the rights to Spider-Man, these two films represent their effort to be a part of that Marvel Universe but are doing their part to stand out from it as well. In order to do so, they have rounded up their share of A-list actors such as Tom Hardy to play Venom, and a seasoned team of animators to create an entertaining version of Spider-Man and these multi-verse variants. 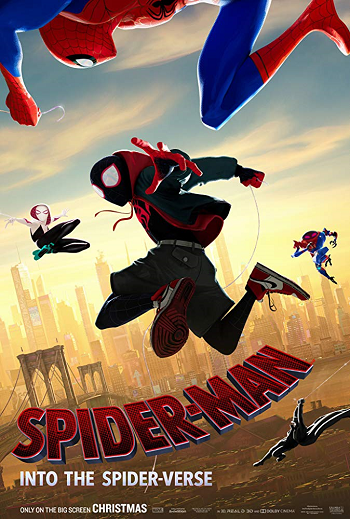 The directing trio of Bob Persichetti, Peter Ramsey, and Rodney Rothman coalesced in 2017, and they all decided to make a unique film with a style which combined Sony Pictures Imageworks’ in-house computer animation with traditional hand-drawn comic book techniques inspired by Sara Pichelli, Miles Morales’s co-creator. Up to 140 animators – the largest crew ever used by Sony – made the critically acclaimed Spider-Man: Into the Spider-Verse. Snarky though it be, it also prompts much thought on what other multi-verse Spideys are possible. Some of weird ones already imagined include Spider-Man Noir (Nic Cage) and Spider-Ham (John Mulaney) – a talking cartoon pig in a Spider-Man outfit. A sense of humor also pervaded Venom, but it didn’t get much critical acceptance, though fans online have likened the film to be a metaphor for queer relationships. But despite it getting mostly bad reviews, it had great audience numbers. With that success on hand, coupled with the critical enthusiasm for Spider-Man: Into the Spider-Verse, sequels and several spin-offs are already in development. And, since comic-book superhero mega features have become conceptually tired, these two relatively stimulating re-thinks are worth seeing on the big screen. Copyright ©2018 PopEntertainment.com. All rights reserved. Posted: December 14, 2018. Tags: animated, Bob Persichetti, Brian Tyree Henry, Chris Pine, Christian Convery, Donald K. Overstreet, Edwin H. Bravo, Greta Lee, Hailee Steinfeld, Into the Spider-Verse, Jake Johnson, Jeff Pinker, Jenny Slate, John Mulaney, Jorma Taccone, Kathryn Hahn, Kelly Marcel, Kimiko Glenn, Lake Bell, Liev Schreiber, Lily Tomlin, Luna Lauren Velez, Mac Brandt, Mahershala Ali, Marcella Bragio, marvel comics, Melora Walters, Michelle Fang, Michelle Lee, Michelle Williams, Natalie Morales, Nicolas Cage, Oscar Isaac, Peter Ramsey, Phil Lord, Post Malone, Reid Scott, Riz Ahmed, Rodney Rothman, Ron Cephas Jones, Ruben Fleischer, Sam Medina, Scott Haze, Scott Rosenberg, Shameik Moore, Sony, Sope Aluko, spider-man, Spider-Man: Into the Spider-Verse, Stan Lee, Tom Hardy, Venom, William W. Barbour, Woody Harrelson, Zoë Kravitz. Bookmark the permalink.